Log into your OpenCart admin panel. In your browser address bar type http://yourdomain.com/admin. If you have installed your Opencart under a subfolder ‘store’, the above URL will change to http://yourdomain.com/store/admin. Log in using your username and password. Currency Name – Name of the currency. Code – Name of the currency. You can find a list of codes here. All currency codes must be in uppercase. Symbol Left – The left currency symbol if the currency has one. For example, the pound sign (Ј) for pound sterling. Symbol Right – The right currency symbol if the currency has one. For example, the euro sign (Ђ). Decimal Places – The number of decimal places used for a particular currency. Some currencies use more than 2 decimal places such as the Kuwaiti Dinar. Value – The currency value compared to your default currency. If the currency you are entering is going to be your default currency, you should set the value to 1.00000. 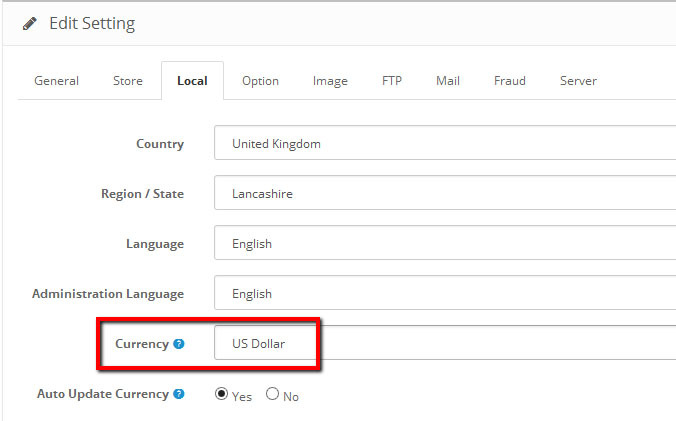 The currency value will change automatically if you have auto update currency set to yes. 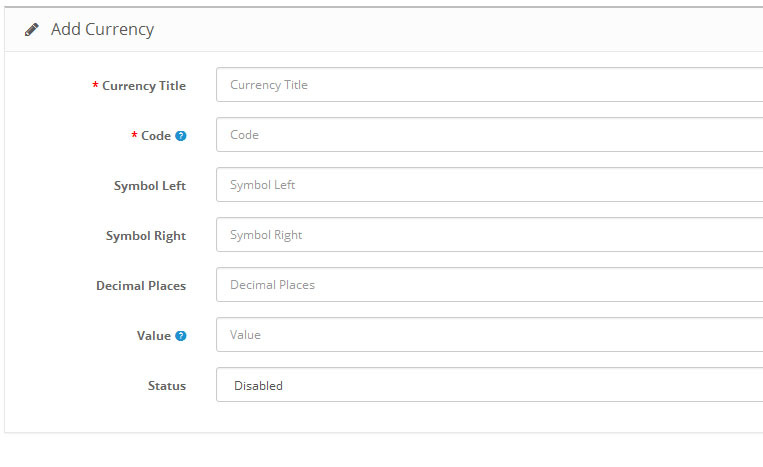 Status – You can enable/disable the currency on the frontend. Please set up your currency and Save the changes.